Participation in sports activity and regular physical training is associated with physiological structural and electrical changes in the heart (athlete’s heart) that enable sustained increases in cardiac output for prolonged periods. Cardiovascular remodelling in the conditioned athlete is often associated with ECG changes. In rare cases, abnormalities of an athlete’s ECG may reflect an underlying heart disease which puts the athlete at risk of arrhythmic cardiac arrest during sport. It is mandatory that ECG abnormalities resulting from intensive physical training and those of a potential cardiac pathology are properly defined. This article provides a modern approach to interpreting 12-lead ECGs of athletes based on recently published new findings. The main objective is to distinguish between physiological adaptive ECG changes and pathological ECG abnormalities. The most important aims are to prevent physiological changes in the athlete being erroneously attributed to heart disease, or signs of life-threatening cardiovascular conditions being dismissed as a normal variant of athlete’s heart. As pathological ECG abnormalities not only cause alarm but also require action with additional testing to exclude (or confirm) the suspicion of a lethal cardiovascular disorder, appropriate interpretation of an athlete’s ECG will prevent unnecessary distress and also result in considerable cost saving in the context of a population-based preparticipation screening programme. Athletes’ ECG abnormalities can be divided into two groups: common and training-related; uncommon and training-unrelated. This classification is based on prevalence, relation to exercise training, association with an increased cardiovascular risk, and need for further clinical investigation to confirm (or exclude) an underlying cardiovascular disease (table 1). Trained athletes commonly (up to 80%) show ECG changes such as sinus bradycardia, first-degree atrioventricular (AV) block and early repolarisation, which result from physiological adaptation of the cardiac autonomic nervous system to athletic conditioning, such as increased vagal tone and/or withdrawal of sympathetic activity.10 Moreover, the ECGs of trained athletes often exhibit pure voltage criteria (ie, based only on QRS amplitude measurements) for left ventricular (LV) hypertrophy that reflect physiological LV remodelling with increased LV wall thickness and chamber size. This classification of ECG abnormalities has important implications for the athlete’s cardiovascular management, including clinical diagnosis and risk stratification. Common ECG changes due to cardiac adaptation to physical exertion should not cause alarm, and the athlete should be allowed to participate in competitive sports without additional evaluation. Hence, further diagnostic work-up is only needed for the subset of athletes with uncommon and sports-unrelated ECG changes, which potentially reflect an underlying heart disease with an increased risk of SCD (group 2). This distinction of physiological from pathological ECG abnormalities provides favourable consequences for diagnostic accuracy and cost savings. Resting sinus bradycardia, as defined by a heart rate <60 beats/min, is almost universal in athletes, depending on the type of sport and the level of training/competition.18 19 20 Escape junctional beats or rhythm may be recorded in athletes with more severe bradycardia and result in functional AV dissociation. Sinus arrhythmia is also reported with widely varying frequency, from approximately 15% to 70%.18 21 Sinus bradycardia/arrhythmia disappear during exercise, suggesting that high vagal tone causes slowing of the sinus atrial node. Bradycardia is the result of a physiological adaptive change of the autonomic nervous system and reflects the level of athletic conditioning. Only profound sinus bradycardia and/or marked sinus arrhythmia (<30 beats/min) need to be distinguished from sick sinus syndrome. A sinus atrial node dysfunction can be reasonably excluded by demonstrating that: (1) the decrease in heart rate is appropriate for the level of training and type of sports; (2) symptoms, such as dizziness or syncope, are absent; (3) heart rate normalises during exercise, sympathetic manoeuvres or drugs, with preservation of maximal heart rate; and (4) bradycardia reverses with training reduction or discontinuation. First-degree AV block and Mobitz type I (Wenkebach) second-degree AV block are commonly seen in trained athletes, being present in ∼35% and 10% of athletes’ ECGs, respectively.21 22 23 As with sinus bradycardia, AV conduction slowing and block are mediated by increased parasympathetic tone and/or decreased resting sympathetic tone. Resolution of (asymptomatic) first-degree or second-degree AV block with hyperventilation or exercise confirms its functional origin, and excludes any pathological significance. Type II second-degree (Mobitz type II) and third-degree AV block should prompt exclusion of associated symptoms or underlying structural heart disease. Intensive athletic conditioning is associated with morphological cardiac changes, including increased cavity dimensions, wall thickness and ventricular mass, which are reflected on the 12-lead ECG.1 2 3 The ECG patterns of physiological LV hypertrophy in trained athletes usually manifests as an isolated increase in QRS amplitude, with normal QRS axis, normal atrial and ventricular activation patterns, and normal ST-segment–T-wave repolarisation.11 20 21 24 25 26 Several studies have reported a high incidence (up to 80%) of athletes’ ECGs that fulfil electrocardiographic LV hypertrophy if the criteria of Sokolow and Lyon are used (S wave in V1 + R wave in V5>35 mm).11 23 27 Non-voltage ECG criteria for LV hypertrophy such as atrial enlargement, left axis deviation, a “strain” pattern of repolarisation and delayed intrinsicoid deflection are usually not seen in athletes. These ECG abnormalities infer an underlying pathological LV hypertrophy, as a result of hypertrophic cardiomyopathy (HCM), aortic valve disease or hypertensive heart disease. Athletes showing an isolated increase in QRS voltage on their 12-lead ECG do not require systematic echocardiographic evaluation, unless they have other non-voltage ECG criteria suggesting pathological LV hypertrophy, relevant symptoms or a positive family history of cardiovascular diseases and/or premature SCD. Incomplete RBBB does not require further tests in the presence of a negative family/personal history and physical examination. Because incomplete RBBB is a typical ECG finding in patients with an atrial septal defect of the “ostium secundum” type, particular attention should be paid to exclude related symptoms and a fixed split of the second tone by accurate cardiac auscultation. Typical features of incomplete RBBB are uncommonly observed in patients with arrhythmogenic RV cardiomyopathy/dysplasia (ARVC/D).32 An underlying ARVC/D should be suspected when the pattern of incomplete RBBB is associated with disproportionate extent of T-wave inversion (beyond V2 to include midprecordial V3 and V4 leads) or in the presence of premature ventricular beats with a left bundle branch block (LBBB) morphology. In some cases, incomplete RBBB should be differentiated from a Brugada ECG. The ECG pattern of the ion channel disorder, Brugada syndrome, is characterised by a slow, positive deflection at the R–ST junction (“J wave”), which is most evident in leads V1 and V2, with minimal or no reciprocal changes in other leads33 (fig 1). Unlike the R′ wave seen in RBBB, the J wave suggestive of Brugada syndrome does not indicate a RV delayed activation, but, rather, early repolarisation with J-point elevation and a high take-off ST segment. The down-sloping ST segment is followed by a negative (“coved” type) or a positive (“saddle-back” type) T wave. 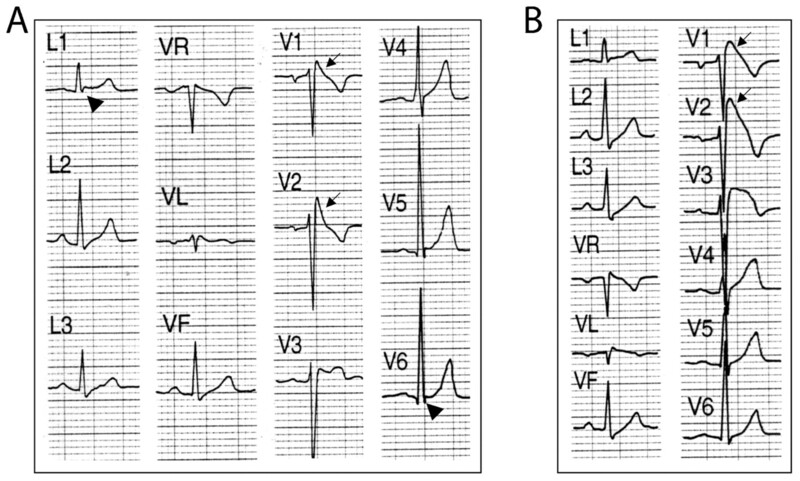 In typical RBBB, the R′ wave recorded in V1 and V2 is distinctively associated with reciprocal S waves in L1 and V6, and the right precordial leads do not show any elevation of the ST segment.34 Differential diagnosis may require in selected cases a drug challenge with sodium channel blockers (fig 1B). (A) Borderline Brugada ECG pattern mimicking incomplete right bundle branch block (RBBB). Unlike the R wave of RBBB, the J wave (arrows) of the Brugada ECG is confined to right precordial leads (V1 and V2) without reciprocal S wave (of comparable voltage and duration) in the leads L1 and V6 (arrowhead). (B) In this case, a definitive diagnosis from the Brugada ECG was achieved by a drug challenge with sodium channel blockers, which unmasked a diagnostic “coved type” (arrows) pattern (V1 and V2). Different patterns of precordial early repolarisation in two healthy athletes. (A) ST-segment elevation with upward concavity (arrows), followed by a positive T wave (arrowheads). (B) ST-segment elevation with upward convexity (arrows), followed by a negative T wave (arrowheads). The magnitude of ST-segment elevation is characteristically modulated by autonomic influences, heart rate changes and drugs; this explains the dynamic nature of the ECG abnormalities and a waxing and waning of the ST-T segment over time.37 Slowing of the heart rate exaggerates ST-segment elevation, whereas sinus tachycardia occurring during exercise or after isoproterenol administration reduces and often eliminates early repolarisation changes. Recently a significantly increased prevalence of the ECG pattern of early repolarisation in the inferior and/or lateral leads with terminal QRS slurring has been reported among patients with a history of idiopathic ventricular fibrillation.43 The study was a retrospective analysis of a very selected patient cohort with episodes of short coupled rapid/polymorphic ventricular tachycardia or ventricular fibrillation leading to syncope or cardiac arrest. The available data do not provide evidence that, in the general population of asymptomatic young people or athletes, this ECG pattern is predictive of an increased risk of malignant ventricular arrhythmias. Early repolarisation is a physiological and benign ECG pattern in the general population of young people and athletes, and does not require further clinical evaluation. In trained athletes, right precordial ST-T changes due to early repolarisation show typical features that may allow differentiation from ARVC/D (fig 3) or Brugada syndrome (fig 4).41 42 44 45 In rare cases, athletes may require pharmacological testing with sodium channel-blocking agents, electrophysiological study or cardiac imaging study to achieve a conclusive diagnosis. (A) Early repolarisation pattern in a healthy black athlete characterised by right precordial T-wave inversion (arrowhead) preceded by ST-segment elevation (arrow). (B) Right precordial T-wave inversion in a patient with arrhythmogenic RV cardiomyopathy/dysplasia (ARVC/D). Note that, unlike early repolarisation, in ARVC/D the right precordial leads do not show any elevation of the ST segment. Most cardiovascular conditions responsible for SCD in young competitive athletes are clinically silent and unlikely to be suspected or diagnosed on the basis of spontaneous symptoms.4 5 6 The 25-year Italian screening experience has shown that 12-lead ECG, in addition to history and physical examination, has substantial value for identifying asymptomatic athletes who have potentially lethal heart disorders, and actually saves lives.46 47 48 49 50 51 52 ECG-detectable cardiovascular diseases include: cardiomyopathies, such as HCM, ARVC/D and dilated cardiomyopathy; aortic valve stenosis; cardiac ion-channel diseases such as long QT syndrome (LQTS), Brugada syndrome, short QT syndrome and Lenegre disease; and Wolff–Parkinson–White syndrome. On the basis of published series from the USA and Italy, overall these conditions account for approximately two-thirds of SCD in young competitive athletes. ECG abnormalities associated with these cardiovascular diseases include repolarisation abnormalities such as inverted T waves and ST-segment depression, pathological Q waves, intraventricular conduction defects, ventricular pre-excitation, long and short QT interval, and Brugada-like repolarisation changes (table 1). Unlike the ECG changes characteristic of athlete’s heart, such potentially risky ECG abnormalities are relatively uncommon (<5%) and training-unrelated. Further diagnostic work-up is mandatory for those athletes who exhibit such ECG changes in order to confirm (or exclude) an underlying cardiovascular disease. Regardless of family and personal history, athletes with non-voltage criteria for LV hypertrophy require an echocardiographic evaluation to exclude underlying structural heart disease and pathological LV hypertrophy, including HCM. Although ST-segment elevation due to early repolarisation is a common finding in the basal ECG of trained athletes, resting ST-segment depression is rarely observed. In the literature, ST-segment depression is usually lumped together with T-wave inversion, making the real incidence of isolated ST-segment depression unknown. Demonstration of ST-segment depression on resting ECG, either isolated or associated with T-wave inversion, should prompt further investigations to exclude heart disease. ECG criteria for right atrial enlargement and/or RV hypertrophy are uncommon findings in athletes. Pelliccia et al11 reported a prevalence of 0.08% for right atrial enlargement and 0.6% for a right axis deviation (>110°) among a large cohort of highly conditioned athletes. The Sokolow–Lyon voltage criterion for RV hypertrophy (R−V1 + S−V5>10.5 mm) was met in one of 172 (0.6%) professional soccer players.57 A higher prevalence of the Sokolow–Lyon voltage criterion for RV hypertrophy was reported by Sharma et al27 among junior elite athletes (12%), although there was no difference from controls (10%). A significant proportion of athletes and non-athletes in this study was younger than 16 years: in this age group a voltage criterion for RV hypertrophy is more common. The ECG pattern of right atrial enlargement and/or RV hypertrophy should not be simply interpreted as a manifestation of exercise-induced cardiac remodelling. The presence of either congenital or acquired heart diseases associated with an increased right atrial size and/or pathological RV dilatation/hypertrophy should be excluded by an appropriate imaging study. T-wave inversion ⩾2 mm in ⩾2 adjacent leads is rarely observed on the ECG of healthy athletes, whereas it is a common finding in patients with cardiomyopathy. Inverted T waves may represent the only sign of an inherited heart muscle disease even in the absence of any other features or before structural changes in the heart can be detected. Hence, the perspective that T-wave inversion is due to cardiovascular adaptation to physical exercise should only be accepted once inherited forms of cardiovascular disease have been definitively excluded by a comprehensive clinical work-up, including screening of family members/first-degree relatives, and molecular genetic testing when available. In this regard, athletes with postpubertal persistence of T-wave inversion beyond V1 require further clinical and echocardiographic evaluation to exclude an underlying cardiomyopathy such as ARVC/D or HCM. The recent observation that T-wave inversion may identify athletes at risk of subsequent development of structural heart disease underscores the importance of continued clinical surveillance and follow-up by serial ECG and echocardiography evaluations of trained athletes with T-wave repolarisation abnormalities, even in the absence of clinically demonstrable heart disease. The significance of minor T-wave changes such as flat and/or minimally inverted (<2 mm) T waves in ⩾2 leads (mostly inferior and/or lateral) is unclear. These changes usually revert to normal with exercise and are considered a benign ECG phenomenon resulting from increased vagal tone. Like deep inverted T waves, however, such minor T-wave abnormalities are uncommonly encountered in the athlete heart (<0.5%),27 but are common in cardiomyopathy. This indicates that they may have a pathological basis and should be cautiously investigated and followed-up over time before they are definitively ascribed to physiological neuroautonomic remodelling. A prolonged QRS (>110 ms) not satisfying the criteria for either LBBB or RBBB is referred to as non-specific intraventricular conduction defect.34 Because the conduction delay occurs in the ventricular myocardium rather than in the specialised conduction system, this conduction defect is a special ECG indicator of a possible heart muscle disease and requires accurate cardiovascular investigation. For instance, localised prolongation of the QRS complex (>110 ms) in the leads exploring the right ventricle (V1–V3), often associated with an “epsilon wave” (ie, a terminal notch in the QRS complex) and/or delayed S-wave upstroke, is considered to be an ECG marker for ARVC/D (fig 5). 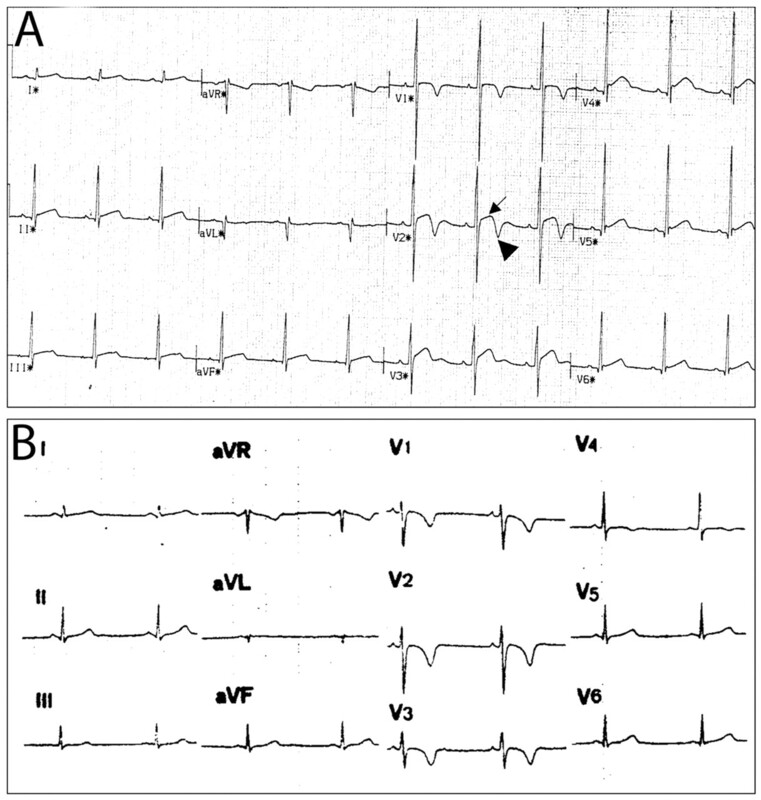 ECG recording of a patient with arrhythmogenic right ventricle (RV) cardiomyopathy/dysplasia showing a non-specific RV conduction defect, which is characterised by an increase in QRS duration (115 ms) in the right precordial leads, associated with an epsilon wave (arrow) in V1 (ie, a low-amplitude, low-frequency wave occurring after the end of the QRS) and a prolonged S-wave upstroke in V1 and V2 (arrowhead). The prevalence of ventricular pre-excitation in the general population varies from 0.1% to 0.3% and does not differ in athletic populations. Sports activity in the presence of overt pre-excitation may expose the athlete to an increased risk of SCD if the AV accessory pathway has the potential for fast antegrade conduction.66 67 Athletes with ventricular pre-excitation should be referred to a specialist for evaluation by electrophysiological study, either transoesophageal or intracardiac, for the inducibility of AV re-entrant tachycardia and the anterograde refractory period of the accessory pathway (shortest pre-excited RR interval at rest and during exercise or adrenergic drug stimulation), which influence eligibility for athletic competition, risk stratification and treatment, including catheter ablation. Demonstration of a QTc value (ie, QT interval corrected by heart rate using Bazett’s formula) ⩾500 ms, otherwise unexplained, is indicative of unequivocal LQTS, regardless of family history and symptoms. Borderline QTc prolongation <500 ms requires further evaluation to achieve a conclusive diagnosis.68 Twenty-four hour Holter monitoring may allow recording of more pronounced (diagnostic) QTc prolongation or associated ST-T morphological abnormalities over time, T-wave alternans and polymorphic ventricular tachycardia. Exercise testing may enhance diagnostic accuracy because shortening of the QT interval during effort is inadequate and/or repolarisation abnormalities become more prominent and recognisable after exercise (in the recovery phase) in patients with LQTS. The ECG response to exercise may vary according to LQTS genotype: the QTc prolongs in LQT1, remains unchanged in LQT2, and shortens excessively in LQT3 patients.69 Athletes with a clear-cut prolonged QTc interval should be referred to a cardiac specialist for definitive diagnosis and risk stratification of LQTS, including molecular screening of causative gene mutations. A short QT syndrome should be considered in the presence of a QTc interval <340 ms and no evidence of secondary QT interval shortening.70 The identification of an abnormally short QT interval in an athlete should enable familial cascade screening and molecular genetic evaluation. Brugada syndrome should be considered in the presence of an early, high-take-off and down-sloping ST-segment elevation (J wave) of either the coved (negative T wave) or saddle-back (positive T wave) type in V1–V3 (fig 1), in the absence of other causes of right precordial ST-segment elevation, such as cardiomyopathy, myocarditis or antidepressive drugs.71 72 Analysis of the ST-T waveform usually permits differential diagnosis with right precordial early repolarisation seen in athlete’s heart. Athletes exhibit an up-sloping ST segment with a mean STJ/ST80 ratio ⩽1, whereas patients with Brugada syndrome show a down-sloping ST segment with a STJ/ST80 ratio >1 (fig 4). In very selected cases, a pharmacological test with sodium channel-blocking agents is required to achieve a definitive diagnosis. The athlete with a diagnosis of Brugada ECG should be referred to a cardiologist/electrophysiologist for risk stratification and familial clinicogenetic screening. The future for prevention of sports-related SCD by a population-based ECG screening programme lies in continuing efforts aimed to further understand the scientific basis for ECG interpretation and to better define standards of ECG criteria for differentiation between athlete’s heart and true heart diseases, taking into account variations by gender, ethnicity and various types and levels of sports activity. Use of modern ECG criteria to distinguish physiological from pathological changes in trained athletes will result in improved accuracy and cost-effectiveness when screening athletes for cardiovascular diseases that predispose to SCD. The presumption that ECG is a poor screening tool for cardiovascular disorders in athletes is based on (1) the knowledge that ECG abnormalities occur often in trained athletes as a consequence of adaptive changes of the heart to sustained physical exercise, and (2) the misconception that most ECG abnormalities in athletes overlap with ECG findings of cardiovascular diseases that hold the risk of sudden death. The long-term Italian experience with preparticipation ECG screening has disproved the old concept of the low cost-effectiveness of ECG testing. This article provides cardiologists and sports medicine physicians with a modern approach to the correct interpretation of 12-lead ECGs in athletes.
. The athletic heart syndrome. N Engl J Med 1985;315:24–32.
. Athlete’s heart. Heart 2003;89:1455–61.
. The electrocardiogram in the highly trained athlete. Cardiol Clin 1992;10:295–302.
. Sudden death in young competitive athletes: clinico-pathologic correlations in 22 cases. Am J Med 1990;89:588–96.
. Sudden death in young athletes. N Engl J Med 2003;349:1064–75.
. Sudden death in young athletes. Lancet 2005;366(Suppl 1):S47–8.
. The athlete’s electrocardiogram. Am J Emerg Med 2006;24:77–86.
. Appropriate interpretation of the athlete’s electrocardiogram saves lives as well as money. Eur Heart J 2007;28:1920–2.
. Clinical significance of abnormal electrocardiographic patterns in trained athletes. Circulation 2000;102:278–84.
. Prevalence of abnormal electrocardiograms in a large, unselected population undergoing pre-participation cardiovascular screening. Eur Heart J 2007;28:2006–10.
. Association of angiotensin-converting enzyme gene I/D polymorphism with change in left ventricular mass in response to physical training. Circulation 1997;96:741–7.
. Angiotensinogen gene M235T polymorphism predicts left ventricular hypertrophy in endurance athletes. J Am Coll Cardiol 1999;34:494–9.
. Relation of race to electrocardiographic patterns in elite American football players. J Am Coll Cardiol 2008;51:2250–5.
. Ethnic differences in left ventricular remodelling in highly-trained athletes: relevance to differentiating physiologic left ventricular hypertrophy from hypertrophic cardiomyopathy. J Am Coll Cardiol 2008;51:2256–62.
. The heart of trained athletes: cardiac remodeling and the risks of sports, including sudden death. Circulation 2006;114:1633–44.
. Common ECG changes in athletes. Cardiology 1976;61:267–78.
. Electrocardiogram of the athlete: an analysis of 289 professional football players. Am J Cardiol 1984;53:1339–43.
. Frequency morphology and meaning of the electro-cardiographic anomalies found in Olympic marathon runners and walkers. J Sports Med Phys Fitness 1964;4:135–41.
. Wenckenbach AV block: a frequent feature following heavy physical training. Am Heart J 1975;990:426–30.
. ECG variants and cardiac arrhythmias in athletes: clinical relevance and prognostic importance. Am Heart J 1990;119:1378–91.
. The noninvasive cardiac evaluation of long-distance runners. Chest 1978;73:376–81.
. Electrocardiograms of 25 marathon runners before and after 100 meter dash. Jpn Circ J 1969;33:105–26.
. Electrocardiogaphic diagnosis of exercise-induced left ventricular hypertrophy. Am Heart J 1988;116:784–90.
. Electrocardiographic changes in 1000 highly trained junior elite athletes. Br J Sports Med 1999;33:319–24.
. Electrocardiographic findings in athletes: the prevalence of left ventricular hypertrophy and conduction defects. Can J Cardiol 2001;17:655–9.
. Cardiovascular and physical capacity findings in argentine soccer professional players. Rev Argent Cardiol 2004;72:263–9.
. 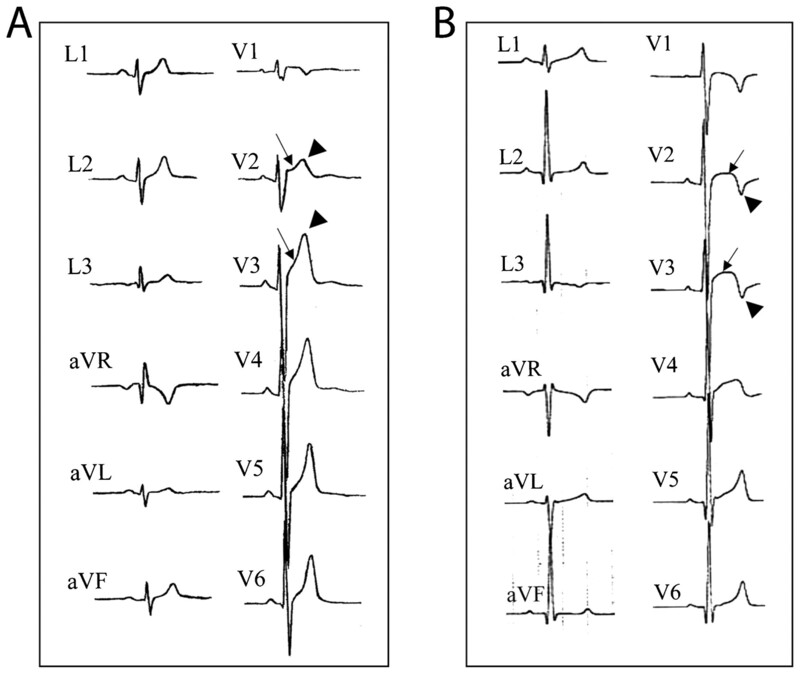 Incomplete right bundle branch block: An electrocardiographic enigma and possible misnomer. Circulation 1971;44:678–87.
. Noninvasive assessment of seasonal variations in cardiac structure and function in cyclists. Circulation 1983;97:896–901.
. Arrhythmogenic right ventricular cardiomyopathy: diagnosis, prognosis, and treatment. Heart 2000;83:588–95.
. Criteria for intraventricular conduction disturbances and pre-excitation. 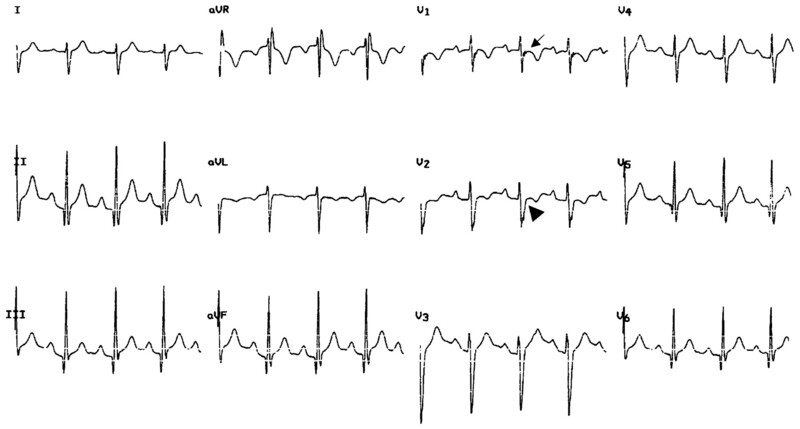 J Am Coll Cardiol 1985;5:1261–75.
. Electrocardiographic manifestations: benign early repolarization. J Emerg Med 1999;17:473–8.
. Benign early repolarization: electrocardiographic manifestations and differentiation from other ST segment elevation syndromes. Am J Emerg Med 1998;16:592–7.
. Early repolarization syndrome: clinical characteristics and possible cellular and ionic mechanisms. J Electrocardiol 2000;33:299–309.
. The early repolarization variant: an electrocardiographic enigma with both QRS and JSTT anomalies. J Electrocardiol 2007;40:3e1–3e10.
. Medical examination and electrocardiographic analysis of elite distance runners. Ann N Y Acad Sci 1977;301:283–96.
. Does early repolarization in the athlete have analogies with the Brugada syndrome? Eur Heart J 2001;22:504–10.
. ST segment elevation and sudden death in the athlete. In: Antzelevitch C, ed. The Brugada syndrome: from bench to bedside. Oxford: Blackwell Futura, 2005:119–29.
. Sudden cardiac arrest associated with early repolarization. N Engl J Med 2008;358:2016–23.
. Dispersion of ventricular depolarization-repolarization: a noninvasive marker for risk stratification in arrhythmogenic right ventricular cardiomyopathy. Circulation 2001;103:3075–80.
. Electrocardiographic features of arrhythmogenic right ventricular dysplasia/cardiomyopathy according to disease severity; a need to broaden diagnostic criteria. Circulation 2004;110:1527–34.
. Screening for hypertrophic cardiomyopathy in young athletes. N Engl J Med 1998;339:364–9.
. Cardiovascular pre-participation screening of young competitive athletes for prevention of sudden death: proposal for a common European protocol. Consensus Statement of the Study Group of Sport Cardiology of the Working Group of Cardiac Rehabilitation and Exercise Physiology and the Working Group of Myocardial and Pericardial Diseases of the European Society of Cardiology. Eur Heart J 2005;26:516–24.
. Pre-participation screening of young competitive athletes for prevention of sudden cardiac death. J Am Coll Cardiol 2008;52:1981–9.
. Trends in sudden cardiovascular death in young competitive athletes after implementation of a preparticipation screening program. JAMA 2006;296:1593–601.
. Electrocardiograms should be included in preparticipation screening of athletes. Circulation 2007;116:2616–26.
. Preparticipation screening for cardiovascular abnormalities in young competitive athletes. BMJ 2008;337:a1596.
. Contemporary approaches to the identification of athletes at risk for sudden cardiac death. Curr Opin Cardiol 2008;23:494–501.
. The standard electrocardiogram as a screening test for hypertrophic cardiomyopathy. Am J Cardiol 1995;76:689–94.
. Hypertrophic cardiomyopathy: two-dimensional echocardiographic score versus clinical and electrocardiographic findings. Clin Cardiol 1989;12:443–52.
. Marginal overlap between electrocardiographic abnormalities in patients with hypertrophic cardiomyopathy and trained athletes: implications for preparticipation screening. Circulation 2007;116:765 [abstract 3390].
. An echocardiographic assessment of cardiac morphology and common ECG findings in teenage professional soccer players: reference ranges for use in screening. Heart 2001;85:649–54.
. Prevalence and clinical significance of right precordial T-wave inversion at electrocardiographic preparticipation screening: a prospective study on 3086 young competitive athletes. Circulation 2007;116:765 [abstract 3392].
. Experience from clinical genetics in hypertrophic cardiomyopathy: proposal for new diagnostic criteria in adult members of affected families. Heart 1997;77:130–2.
. Outcomes in athletes with marked ECG repolarization abnormalities. N Engl J Med 2008;358:152–61.
. Prevalence of intraventricular block in the general population: the Framingham Study. Am Heart J 1989;117:903–10.
. Right bundle branch block: varying electrocardiographic patterns. Aetiological correlation, mechanisms and electrophysiology. Int J Cardiol 1999;71:33–9.
. Left bundle branch block: prevalence, incidence, follow-up and outcome. Eur Heart J 1987;8:1075–9.
. Hemiblocks revisited. Circulation 2007;115:1154–63.
. Novel SCN5A mutation leading either to isolated cardiac conduction defect or Brugada syndrome in a large French family. Circulation 2001;104:3081–6.
. Recommendations for participation in leisure-time physical activity and competitive sports of patients with arrhythmias and potentially arrhythmogenic conditions. Part 1: supraventricular arrhythmias and pacemakers. Eur J Cardiovasc Prev Rehabil 2006;13:475–84.
. The asymptomatic patient with the Wolff–Parkinson–White electrocardiogram. Pacing Clin Electrophysiol 1997;20:2082–6.
. The congenital long QT syndrome and implications for young athletes. Med Sci Sports Exerc 2006;38:816–25.
. Short QT syndrome. Update on a recent entity. Arch Cardiovasc Dis 2008;101:779–86.
. Proposed diagnostic criteria for the Brugada syndrome. Eur Heart J 2002;23:1648–54.
. Brugada syndrome: report of the second consensus conference. Heart Rhythm 2005;2:429–40. Funding This work was supported by the Italian Society of Sports Cardiology (SIC Sport), the Italian Federation of Sports Medicine (FMSI) and the Fondazione Cariparo, Padova e Rovigo, Italy.